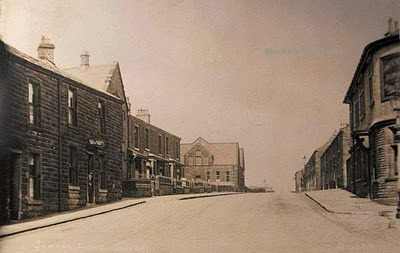 School Lane, Guide in about 1925. This view hasn't changed very much over the 85 years or so since this photo was taken. The garden fronted houses on the left are still there, as are the terraces on the right and the King Edward Vll pub on the corner of Haslingden Road. I think the stone houses on the extreme left of the photo are also still there (isn't one a Chinese restaurant now?) and the pitched roof just further on was (I think) the Conservative Club. I can remember going to collect a TV from there in the 1970's when it was some electronics retailer. The St James School building in the centre of the picture has definitely gone though. It's not too clear, but I think the sign on the corner of the King Edward is a Nuttall's (Lion Brewery) sign. The pitched roof building on the left was Frank Ford's wholesale outlet. Frank Ford (I hoped someone would know the name) - Thanks for the info. Yes it was Anonymous, but it was built by Nuttalls who owned the brewery before they sold it to Matthew Brown and the sign mentioned in my caption above dates from Nuttalls ownership. They only sold the brewery to MB in 1927. The postcard dates to 1935, but the photo is probably ten years older, ie circa 1925.